SAS or Serial Attached SCSI has become the new standard for communication between servers and data storage devices including both tape drives and libraries as well as disk drives and disk arrays. Of course just like traditional SCSI you will need to ensure you have the correct cables to connect your server to your storage devices and so we have prepared this post on SAS connectors to enable you to correctly identify the various connector types used for SAS devices and their typical uses. The standard 7-pin connector is probably the most widely used of the connectors as virtually every motherboard produced in recent years has had multiple 7-pin SATA connectors. Some SAS backplanes also utilize the 7-pin data connectors and an example would be the Supermicro SC933T-R760B which has a backplane that connect through the use of these 7-pin connectors. Usually however these connectors are used for connecting individual internally mounted Disk/Tape drives to a motherboard or HBA/RAID card. The SFF-8087 connector is a widely used connector type that is commonly used today on SAS cards. It carries the equivalent of four SATA/ SAS 7-pin connections through a SFF-8087 to SFF-8087 cable providing up to 12Gb/s of throughput using SAS I or SATA II 3.0Gb/s or up to 24Gb/s using SAS II or SATA III 6.0Gb/s devices. SFF-8087 connectors tend to have locking mechanisms that click into place when a cable is inserted to prevent the connector from working loose in transit or from vibration. These connectors are often used to connect a SAS Expander backplane to a RAID/HBA card. These SAS Expanders allows many SAS Devices to be connected to a RAID card or HBA using fewer physical ports, sometimes at the expense of overall throughput depending on the number of devices connected to the SAS expander. 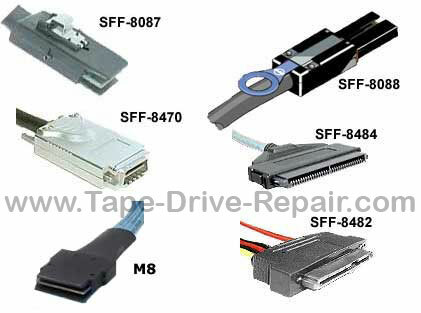 The SFF-8088 connector is primarily used to connect one chassis to another chassis through the use of external cabling. The SFF-8088 has perhaps become the most widely used external cable interconnect for SAS. A SFF-8088 cable is capable of carrying four data lanes (and is equivalent to an external version of the SFF-8087). The SFF-8088 cables firmly lock into place and have a release clip to unlatch. This may seem a minor point to mention but it is important to point out that an accidental disconnection may cause a whole array of active disks to drop offline (causing data corruption) or a tape drive or library to drop offline mid backup with not enough time left to rerun the failed backup. Infiniband is a high-performance computing fabric developed to achieve high bandwidth and low latencies. CX4 cabling is used with a SFF-8470 connector to provide a high-performance SAS interconnect and was the predecessor to the SFF-8088. Most newer generation SAS cards have now adopted the SFF-8088 connector, but some older cards can still be found with the SFF-8470 connector. The CX4/ SFF-8470 connectors are also used on cards that provide high-speed data transmission between servers, making Infiniband not an exclusively storage related connector. This connector is the standard SAS / SATA hard drive connector which is compatible with SAS and SATA drives. It provides both data and power to drives through one connector, instead of the standard seven pin data plus SATA power connector found in most consumer applications. In many instances, the SFF-8482 connector has a data cable branching off of a four port cable with a four-pin molex power connector feeding the SFF-8482 connector. The most common use of the SFF-8482 connector is in SAS / SATA backplanes as this single connector is able to perform all necessary interconnects as well as allowing hot-swap ability (depending on the chassis). The male portion of the connector can be either SAS or SATA power and 7-pin data connectors. While one can plug a SATA drive in the SAS SFF-8482 connector, one cannot plug a SAS drive into the SATA variant due to a piece of plastic bisecting the 7-pin data connector and SATA power connector. The SFF-8484 connectors are commonly found on older-generation SAS/ SATA controllers as the industry has moved to the SFF-8087 standard for internal four lane connections. I would suggest avoiding cards and backplanes with SFF-8484 connectors. The SAS community has really moved away from the SFF-8484 connector at this point in favour of standardising on the SFF-8087 internal connector. As a result, you might risk purchasing a cable or card that will be of limited or no use with future controllers and backplanes. The SFF-8644 connector type is not the most common out there which makes it quite expensive. The cables have two pieces of PCB so instead of a single cable run, the cable must be split into two, one lead going to each PCB. This clearly adds cost as they are not straight through connectors terming to one end point. Avoid these where possible due to supply issues and try to stay with the more common connectors.